We recently had the pleasure of outfitting the local Merry Maids franchise here in Ottawa with 6 of our GO5 GPS Tracking units. This was a real treat for a summers morning installation. We met Stephanie the Office Manager at 08:00 and before you could say “Clean Up” we had all 6 Merry Maids cars all installed with GO5 GPS units. 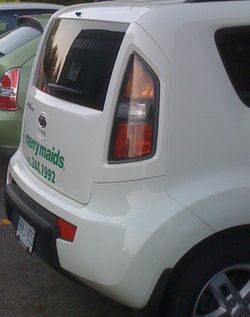 Merry Maids had been using GPS in the past from 2 different cellular providers and was looking for a change. By 08:25 all six cars were off on their respective cleaning runs for the day & we went inside to do the live training on the Geotab Checkmate web portal.